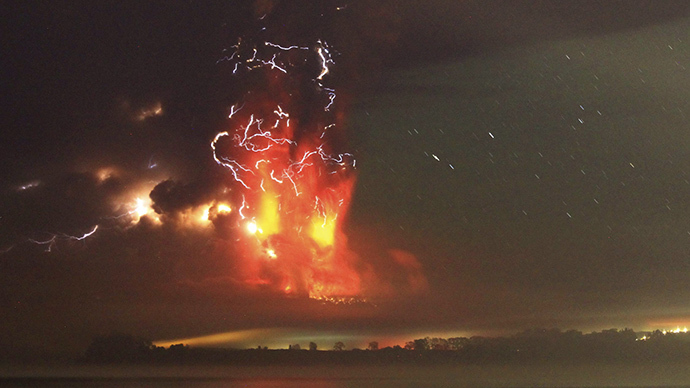 For the second day, Chile’s Calbuco volcano is terrorizing neighborhoods, erupting spurts of molten lava, thick smoke and bright lightning. Clouds of ash have blanketed nearby cities and are heading to the capital, Santiago, and neighboring Argentina. This spectacular video shows orange plumes extending miles into the sky. An electrical storm mixed with lava seemed to merge with the surrounding landscape. Calbuco is located near the tourist location of Puerto Varas, about 1,000km south of Santiago. The winds have already carried some of ash clouds to the city of Chillan, which is only 400km from the capital. According to government meteorologist Arnoldo Zuniga, the ash may reach the city by Friday evening. The eruption forced the cancelation of flights in the neighboring cities in Chile and Argentina. A total of 5,000 people were reportedly evacuated from the affected area, authorities said, adding that evacuation radius of 21km has been established. So far two eruptions occurred – on Wednesday and on Thursday. Chile's National Geology and Mines Service said that a third eruption is possible. In the meantime, most of ash clouds headed to the Andes Mountains into Argentina, and experts say they can get to Buenos Aires province. Volcanic eruptions are frequent in Chile, which has in total of active 500 volcanoes. It is considered to have the second largest chain of volcanoes in the world after Indonesia.